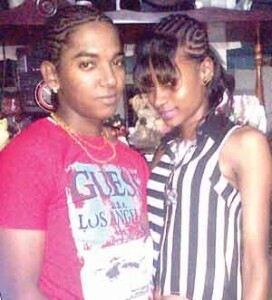 Shivanand Roopnarine and his late girlfriend, Alicia Mc Pherson. Almost one year after a man stabbed his girlfriend to death at Sophia, Greater Georgetown, he was caught Friday in Linden and has already admitted to killing her. Shivanand Roopnarine has been already brought to Georgetown for questioning . He is facing a charge of murder. Police have long identified the 23-year old man as the prime suspect in the killing of Alicia Mc Pherson. Head of the Guyana Police Force’s Criminal Investigations Department, Senior Superintendent Wendell Blanhum told Demerara Waves Online News that Roopnaraine was recognised by a policeman at the Mabura check-point. “He has already admitted to investigators that he committed the murder and they took him back to the scene in an effort to locate the murder weapon,” Blanhum said. It was not immediately clear whether the weapon was found. Investigators have already learnt that Roopnarine allegedly lured the 19-year old woman away from a dance on April 19, 2015 at ‘B’ Field, Sophia and then allegedly stabbed her multiple times and leaving her to die. Roopnarine’s last known address was 478 School Street, Grove, East Bank Demerara.